Weinanbau (or Weinbrau) is how you say viticulture in German. 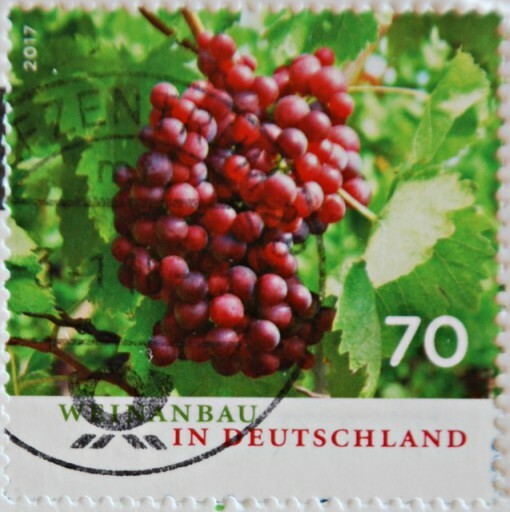 Viticulture is from the latin for 'vine'. 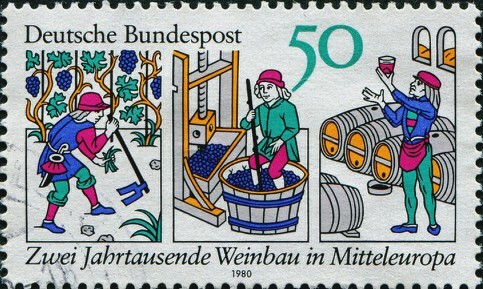 in celebration of German wine making. In the shape of Germany! This wine business has been going on for over two millennia as celebrated in this stamp of a woodcut from the 1309 textbook Rucelia commoda by Petrus de Crescentiis showing the steps in winemaking - planting, harvesting and aging. I like the woodcut from 1309. Simple but quite beautiful. I think I had seen the first stamp, but I didn't notice the shape of Germany, how nice. Actually, both stamps are wonderful. I have a friend who would be delighted of receiving those! I love that 1980 stamp! As said, simple but beautiful and gives you an actual insight of how wine is made. Wine - what a fantastic choice for W! 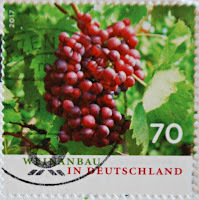 I agree, the grapes in the shape of Germany is really clever, as they do look natural on that stamp. Beautiful stamps, and also I didn't see the shape of our neighbouring country until I read about it. The illustrations are great, too. Thinking 'illustrations' something from the past two or three centuries, it is amazing to realize that the woodcuts have been made 700 years ago! Great synchronicity - I'm reading "Cork Dork" right now about a woman's journey to become a sommelier. Long may the industry continue. Great stamps.